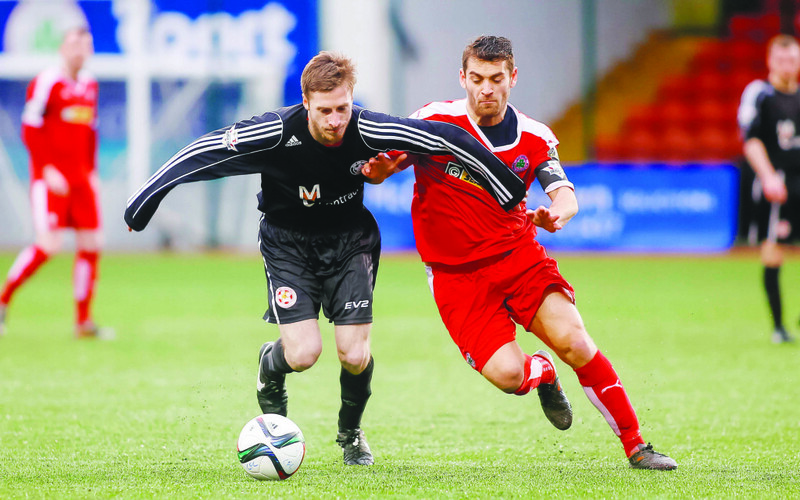 SPORT and Leisure Swifts manager Packie McAllister felt his side’s 4-0 defeat to Cliftonville in the Sixth Round of the Tennents Irish Cup flattered the North Belfast side. Two early goals from Jay Donnelly had Cliftonville in the ascendancy early on, but the Swifts steadied the ship and it wasn’t until the last 20 minutes that the Reds put the tie beyond doubt with goals from captain, Ryan Catney and another from Donnelly to secure his hat-trick. Speaking after the game, McAllister felt that his side performed admirably for an hour and showed some great character. “I thought 4-0 flattered Cliftonville,” reflected McAllister. “Everything we talked about during the week went out the window when we were 2-0 down early on, but I have to give my players a lot of credit for the way we regrouped and for a good hour we were right in the game. “We’d a couple of wee half chances when it was 2-0 and then the longer the game went on we pushed an extra one up to try and nick something. But we made two or three really bad mistakes for their goals and it’s not as if we were under pressure all day and our keeper was being peppered with shots and stuff like that. At 2-0 down after nine minutes McAllister admitted he was slightly worried that his side would take ‘an absolute tanking’. “I absolutely did worry 100 per cent,” said McAllister. “We didn’t want to come here and get an absolute tanking and we wanted to come off the pitch with our heads held high and we did that. McAllister was full of praise for former Cliftonville reserve team striker Kevin Lynch who led the line well all day and proved a consistent threat. McAllister feels his striker is capable of playing at a higher level. “Kevin Lynch was outstanding,” admitted McAllister. “I said before the game, he will cause any central defence problems with his pace, his touch, his work rate and stuff like that. The Swifts are currently sitting in seventh position in Championship Two having played just 11 games with games in hand over a lot of the sides ahead of them. McAllister is targeting a higher finish than last season, when the Swifts missed out on promotion by just four points. “We finished fourth last year,” said McAllister. “We were four points off getting promoted so we want to improve and if we perform and show work rate and will to win the way we did today then we should win a lot of games in our league.